Every week from the end of 1978, wheels replaced feet as the way to strut your stuff (or fall over). The California Rollers, which was a general roller skating facility in the Ballroom on non band and Disco nights, was soon to be transformed into something the like of which this country had never seen. 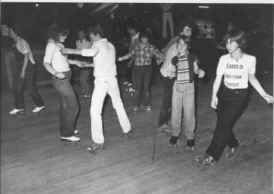 Mick Rutter went out to the States and saw the latest craze for roller discos and became determined to bring them back to the UK. 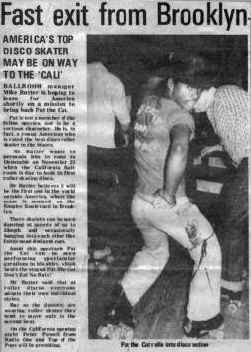 At a cost of 30,000 pounds, the California became the first Roller Disco venue in the country. Opening night saw 270 skaters whizzing around the room to the sounds of DJ Brother Louie and guest celeb Peter Powell. It was a huge success. Coach parties started to come in from all over the country. Expert skaters came in each week to get their fix. 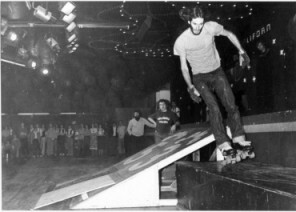 Mick decided to show people what it was really all about and imported some of the top American skaters from Brooklyn to provide demonstrations. Pat the Cat, Vincerelli, Iron Man, Rubber Band Man, Amy Sattel and Paul Wershals wowed the crowds with amazing performances including handstands, back flips and jumps. Ballroom manager Mick Rutter is hoping to leave for America shortly on a mission to bring back Pat the Cat. Pat is not a member of the feline species, nor is he a cartoon character. He is in fact a young American who is rated the best disco roller skater in the States. Mr. Rutter wants to come to Dunstable on November 23 when the California Ballroom is due to hold its first roller skating disco. Mr. Rutter believes it will be the first one in the world outside America where the craze is centred on the Empire Boulevard in Brooklyn. There skaters can be seen dancing at speeds of up to 35 miles an hour and occasionally banging into each other like fairground dodgem cars. Amid this spectacle Pat the Cat can be seen performing spectacular gyrations in his shirt, which bears the slogan Pat the Cat don't eat no rats! Mr. Rutter said that at roller discos everyone attempts their own individual styles. But as dancers are wearing roller skates they tend to move only to the second beat. On the California opening night, Peter Powell from Radio One and Top of the Pops will preside. Sixty youngsters got their skates on in Dunstable last Saturday.... and just skated and skated and skated. In fact four of the skaters kept rolling for around the California Ballroom for 24 hours non-stop. This week the marathon makers along with the 56 other skaters who did four hour stints during the 24-hour session, learned they may have raised nearly £1000 for charity. And, according to California manager Mr. Mick Rutter, the four who stayed on their skates for the entire session may qualify for a mention in the Guinness Book of Records. The foursome were Cheryl Chambers 18, Phil Norris 20 both of Luton : Andy Stinton from Dunstable and Ken Eady from Barton. Regular Cali skater Paul Baker, who organised the sponsored skate-in said: " Everyone who took part was magnificent and the four who carried on to the end were great. For the last nine hours, Cheryl felt very rough but she refused to stop. When they finished the wheels of their skates were red hot." Get ready to get your skates on and get down in the latest craze to hit the discos. They call it roller disco and down at the California Ballroom in Dunstable it's caught on in a big way. Pop in any Thursday night and you'll see loads of roller disco fans whizzing round the floor on a never ending merry-go-round of fun. 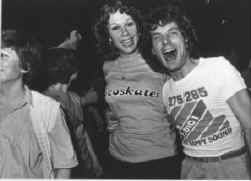 The man who brought roller disco to Dunstable and established the nightspot as the forerunner of the craze in Britain is Mick Rutter, general manager of the California Leisure complex. He went to America to find out how roller disco was really done and was so impressed he decided to bring the idea back home. Mick said "I think it's caught on because it's fun and it's exercise. You can come here alone and go home having made 20 friends. And it's not dangerous - you've got to be going mad to have an accident." 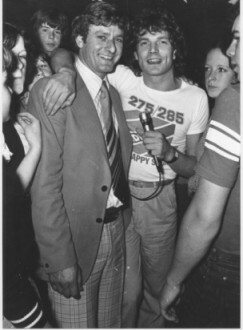 Mick's roller disco has bee such a success that he's had phone calls from as far away as Derbyshire, Cornwall and Wales asking him how to go about setting up other clubs. "When you skate to music you get a lovely gliding sensation that you can't get with ordinary disco dancing." added Mick. The club has won the seal of approval from three dancers who are competing in the Great British Roller Disco championships. Graham Heath, 20 Stephen Lacey, 21 and Les Lacey, 18, travel from Slough to get in on the action. Graham said: "It's brilliant here - at most places there's very little room to dance but here there's a proper track." And Gary Presnell of Beechwood Court, Dunstable said: "I've been coming here since it started and I love it." All age groups flock to the centre - from seven to 35. It's £1 entrance fee for over-14s and 60p for under 14s. That includes the hire of skates. A strange new breed of disco dancers invaded one of the areas top night spots this week and their feet never touched the floor. They bopped and jived round Dunstable's California Ballroom, quickly adjusting to their new found height and curiously fluid mobility provided by some of the weirdest disco footwear ever seen. For the first time outside the United States, sticky soles gave way to well oiled wheels, gliding across the dance floor in a disco extravaganza. Roller Disco had hit town and hundreds of expert and would-be-expert roller skaters went along to join Radio One DJ Peter Powell at the British launch of the new American craze. Said Mick Rutter, manager of the Cali and the man behind the launch: "The atmosphere was fantastic, and Peter Powell was exceptional. Everybody soon managed to find their feet and before long it was just like a really good disco. It was really electrifying." About 270 skaters were allowed in last Thursday - some in their 50s, others as young as seven - and many others had to be turned away. Now Mick is planning to hold roller discos every Thursday and hopes to get two American experts to come over and give demonstrations.